The full Web Conference Programme for 9 November 2018 can now be revealed. This event was previously promoted by us with this short animation. What can artificial intelligence contribute to innovative and creative interactions with digital content? Educational software is often mediated by the use of menus and icons which students control by typing, touching, clicking and speaking. However, technologies increasingly available in our laptops, smartphones and game consoles enable the simultaneous processing of a user’s gaze, facial expression, speech and hand gestures. The purpose of these “sensing” technologies is to regulate and adjust the pace or content of learning materials. They attempt, for example, to enable onscreen characters to react to learners with more appropriate listening behavior and back-channelling since an onscreen character’s responses can take the learner’s facial expressions, replies, gestures, and even physiological states into account with these “sensing” technologies. We will view illustrations of several tools and apps created to detect a learner’s attentional, affective and cognitive states. Our discussion will allow us to reflect together upon some of the challenges and issues the use of such technology invites. Karen Price was a lecturer at the Harvard Graduate School of Education and director of Harvard’s ESL teacher-training program for more than ten years. She has also lectured at Boston University. While at Harvard, she obtained grants from sources including Apple, IBM, and the Exxon Educational Foundation to support research into technology use and second language acquisition, winning an Apple Classroom of the Future award, a ComputerWorld Smithsonian nomination, a CNPAG award from Harvard University, and a Joe Wyatt Challenge award from EDUCOM. She has consulted on projects for government and corporate entities including the US State Department, US Department of Defense, Microsoft, Annenberg, USAID, AmidEast, Fulbright, and Kodak. She conducted the first research into the use of captioned video for language learning and also developed early prototypes of technology now commonly used, such as the lexical search of video. Her other prototyping work includes data-driven language learning projects, talking board games and card games, a MIDI-based system to record, track and analyze individual speaker behavior in a classroom, and a musical staircase in her home. 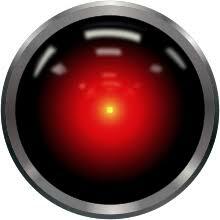 A lifely audience discussion on the pros and cons of Artificial Intelligence. A World CAfE is a new format we are introducing in Adobe Connect. Every attendee is invited to contribute via text and join the discussion. A moderator will facilitate the lively exchange by reading comments out loud or by asking additional questions. The main contributors are those present and we encourage you all to freely express your thoughts, ideas, experiences and more. This presentation will detail the results of two studies on Alexa with Japanese EFL learners. The first was a small-scale case study that investigated the capability of Alexa to understand the L2 speech of EFL students and examined their opinions of the intelligent personal assistant (IPA) for language learning. The results revealed that Alexa’s ability to understand L2 utterances was moderate, with the IPA understanding learner commands at a lower rate compared to speech uttered during a storytelling skill. The study also found that the EFL learners had generally positive views towards its use. The second study had two primary goals: to investigate if Alexa intelligibility of L2 speech differed significantly from that of human raters and to examine if L2 interaction with Alexa promoted pronunciation improvements. The findings indicated that there was a significant difference in the degree of L2 intelligibility between Alexa and native-speaker evaluators. Additionally, the study revealed that the learners improved upon their L2 pronunciation, as indicated by an increase in intelligible output on later attempts of the same commands. The results of the studies highlight the potential pros and cons of using Alexa for language learning, and underscore the need for additional research on IPAs. Gilbert Dizon is a lecturer at Himeji Dokkyo University, Japan. His major research interests are focused on the use of web 2.0 technologies, intelligent personal assistants, and mobile devices to enhance L2 teaching and learning. The ESL Robot project started in 2006 with a grant from The William and Flora Hewlett Foundation. Its goal is to create an electronic English tutor using the state-of-art chatbot technology. Since its beginning, it has served millions of English learners throughout the world. The user data helps improve the program. Students can now chat with “Tutor”, ask questions. “Tutor” knows nearly all the grammar terms, irregular verbs, spellings of American and British English. It can answer questions on various topics including how to learn English, languages and cultures, government and history, geography, and general knowledge questions such as what is the highest mountain, what is the heaviest animal, how many feet are there in a yard, what is the lifespan of a dog, and what is the time now. More new functions are being added to the program. It is now able to correct common ESL errors while students type. With a downloaded app, students can speak instead of typing. It can remember certain things being told. Recently “Tutor” won the First Place in the 2018 Loebner Prize Selection Contest, and the Second Place in the 2018 Loebner Prize Turing Test contest. “Tutor” is a chatbot created with an ESL instructor’s knowledge. The Final Patterns script developed in creating “Tutor” can be used to shorten the time of creating any chatbots. This talk will discuss how chatbots can be used in language education, the limits, and the future. Dr. Ron Chang Lee received his Ph.D. in Educational Technology from University of Illinois at Urbana-Champaign. The ESL websites rong-chang.com and eslfast.com he created years ago have been widely used by ESL/EFL instructors. With a grant he received from the William and Flora Hewlett Foundation in 2006, he created ESL Robot “Tutor” as ESL/EFL instructors’ assistant to help answer students’ questions and practice their English. It’s the first chatbot created with an ESL instructor’s knowledge. In the past few years, “Tutor” has won several awards in chatbots competitions, including the most recent First Place in the 2018 Loebner Prize Selection Contest, and Second Place in the 2018 Loebner Prize Turing Test contest. In a context where student diversity is becoming stronger, teaching must evolve and take into account the new needs that emerge. The same course taught by the same teacher is not perceived and assimilated in the same way by each student. Moreover, the skills and availability of teachers can not be infinitely expanded to meet the magnitude of these new needs. Thus, more and more schools are investing in the personalization of artificial intelligence (AI) -assisted teaching. AI has revolutionized personalized learning through an emerging concept: adaptive learning. Adaptive learning, through progressive assessments that take place throughout the learning process, makes it possible to target the parts of the training that are less well assimilated by the student and provides additional explanations as well as application exercises. Neither too hard, nor too easy, nor boring, nor discouraging, the level of resources thus proposed to the student reduces his risk of dropping out. Customized learning platforms enable peer-to-peer knowledge sharing. The student no longer needs to come back to the teacher for information or explanation: the classmates, but also the users on the platform, are there to help those who need it. Collective intelligence is at the service of everyone thanks to the expert mediation of the teacher. These peer-to-peer exchanges, supported by algorithms, allow platforms like edX or Coursera to propose corrections for most of the exercises constituting the evaluations of higher education. Abir Ghenaiet (M.ed) and (HELM GC) is an articulate qualified Secondary school EFL teacher and ESP instructor who is able to effectively communicate with learners from diverse backgrounds or varying degrees of ability. A committed and dedicated professional with a proven ability to impart, motivate and direct learners to maximum performance by encouraging a positive and energetic environment. Fully conversant with the Algerian English framework and the English National Curriculum. Experienced of exploiting technology in the training setting to provide blended learning and Open education resources. Creating an atmosphere, both comfortable and stimulating, helping learners to grasp organizational cultures and languages and furthering their knowledge of linguistic management, a published author, reviewer and online blogger /designer interested in NPL research and online educational platforms. Are language teachers soon to be obsolete? What kind of technology could do that? What are the links between strong AI, job security, pragmatics, business English and synchronous eLearning? Rob offers a helter-skelter adventure through some of the most exciting and worrying developments of our time. Robert Szabó is an educator, writer, speaker and academic manager based in Cologne, Germany. His interests include systemic functional linguistics, evidence-based TEFL, design thinking, philosophy, diplomacy and geopolitics. He currently serves as the Director, Pedagogy for Business Language and Communication at Learnship. Rob was previously involved with IATEFL BESIG, initially as part of the BOT online team, and then serving on the Committee as Joint Events Coordinator. AIs Make Teachers Better — or Better Teachers? AI-based technology is entering almost all spheres of daily life, with spoken or written language often serving as interaction modality between user and machine. 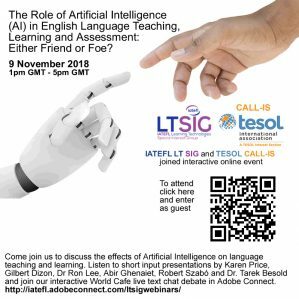 The step from using language as interaction medium with AIs to using AIs in language instruction and learning seems conceptually close — and the potential benefits (at least as promised by some) seem enormous: AIs are presumed to be unbiased in their treatment of different learners, they never tire, they are always available, they can be personalised to individual learner types and characteristics… The list seems to be arbitrarily expandable. In this compact pitch we will have a look at the reality behind the hype, critically examining which of the most prevalent expectations are (or will likely be) met, which are the aspects on which human teachers will long remain superior to artificial instructors, and how a collaborative (rather than a competitive) approach to integrating AI-based technology into language teaching and learning can lead to beneficial synergies and learning experiences which neither (wo)man nor machine can create by themselves. Dr. Tarek A. Besold, PhD is the AI Lead of the Alpha Health AI Lab, working there as a Senior Research Scientist/Topic Leader for the “Trustworthy AI” stream. He also serves as the chairman of the German Institute for Standardisation (DIN) NIA Working Committee on Artificial Intelligence (NA 042-01-42). Previously he was a Lecturer (i.e., Assistant Professor) in Data Science at City, University of London (UK), a postdoctoral researcher at the Digital Media Lab of the University of Bremen (Germany), and a member of the KRDB Research Centre at the Faculty of Computer Science of the Free University of Bozen-Bolzano (South Tyrol, Italy). From 2011 until 2015 he had been working in the AI Research Group of the Institute of Cognitive Science at the University of Osnabrück (Germany), of which he still continues to be an associate member. From January until June 2014 he also had been an academic visitor at the Centre for Intelligent Systems and their Applications (CISA) within the School of Informatics at the University of Edinburgh (Scotland, UK). Finally, he was one of the people involved in the EU-funded Concept Invention Theory (COINVENT) Project. Wrap up – what have we learned? Georgios, is an experienced English Instructor with a demonstrated history of working in the higher education industry in Greece, the United States and the Middle East.. Skilled in Intercultural Communication, English as a Second Language (ESL), Translation, Teaching English as a Foreign Language, and Foreign Languages. He has a strong information technology interest pursuing a Doctor of Philosophy focused in E-Research, Technology Enhanced Learning from Lancaster University. Georgios is a member of the steering committee of TESOL CALL IS and a member of TESOL ANPC (Affiliate Network Professional Council) member. Sophia Mavridi is a teacher trainer, lecturer and researcher specialising in digital learning. She has been involved in ELT since 1998 as a primary & secondary EFL Teacher, Director of Studies, and more recently as an EAP and EdTech lecturer. 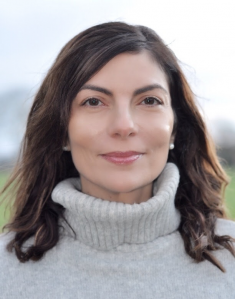 She currently teaches at De Montfort University International College in Leicester, and also delivers learning technology courses, workshops and consultancy as a freelancer around the world. Sophia is the Co-ordinator of the IATEFL Learning Technologies SIG, a special interest group focusing on the pedagogically sound application of technology to language teaching. She also writes reviews for the ELT Journal and works on research projects specialising in media literacies and digital ethics. Heike Philp, CEO of let’s talk online sprl is an edtech and immersive language education integration specialist. Philp co-initiated four European funded projects on teaching and learning a language in real-time at a distance: LANCELOT (LANguage learning with CErtified Live Online Teachers), AVALON (Access to Virtual and Action Learning live ONline) and CAMELOT (CreAting Machinima Empowers Live Online language Teaching and learning) and GUINEVERE (Games Used IN Engaging Virtual Environments for Realtime language Education). Philp founded and organizes several web conferences, Virtual Round Table (language learning technologies) DaFWEBKON (teachers of German), SLanguages Annual Symposium. She co-owns EduNation islands in Second Life. She is Online Events Organiser for the LTSIG. Join by using the QR code below or by watching out for links via our social media channels in the 24 hours leading up to the event.